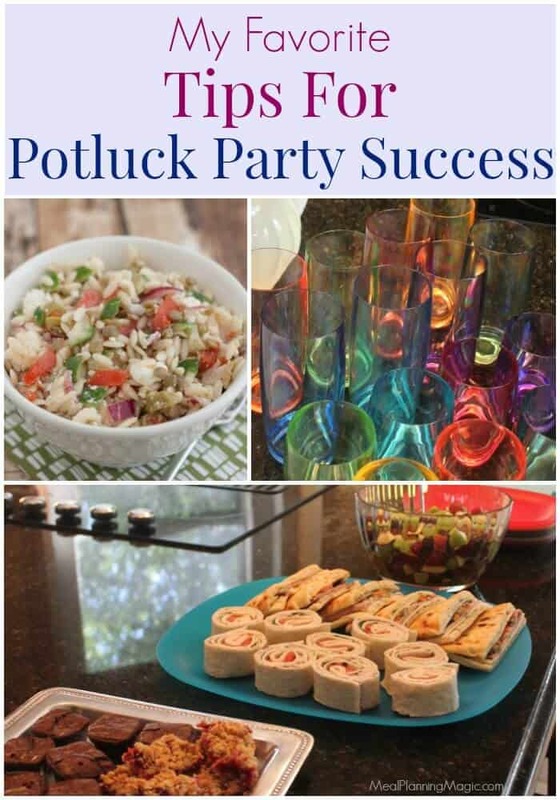 I’ve hosted many potlucks over the years so I’m sharing My Favorite Tips for Potluck Party Success plus several FREE online services to make planning your next potluck a lot easier! I have hosted many a party over the years and one of my favorite things to do is to make it a potluck party! I’ve found that most people like bringing something so that they feel like more of the party process and lots of people, like me, just like a reason to cook or bring yummy food to share! Remember the days of using paper signups or even trying to coordinate via email with a “reply all” option? Those worked ok but they could become confusing and result in too many of the same dishes and not enough of others. Now, there are several online options for organizing your potluck electronically which saves so many headaches for everyone! Today, I’m sharing My Favorite Tips for Potluck Party Success plus several FREE websites options for you check out to use in your planning. These sites do not require participants to have an account although the organizer will need a (free) account to set up the event. I’ve personally used all of these services except the Perfect Potluck site and they all work pretty well. They do have slightly different setups so check them out and choose one that works best for your needs. It may be that one works better one time and a different service works well another time so do what works best for you! Signup (formerly VolunteerSpot) allows you to add options of items for guests to bring but also tasks like helping with setup/cleanup. You can even add multiple dates in your set up if it’s a recurring event (say a monthly potluck for a church group). They have a small selection of image themes to customize your event. Choose to send your invitation via email or social media. They also have an app that participants can download to their phone to keep updated on the go. This service is very customizable. Organize an event with family, co-workers, school, church or other events. It shows how many of a certain item requests have been filled and how many are remaining. It will also send a reminder 24 hours before the event. Evite is fun because they have a TON of image themes to choose for your event to personalize your event. It looks a little more like a paper invitation. This is a general RSVP invitation service but it does have a “What to Bring” option to organize for a potluck party. NOTE: Option to add “What to Bring” will show AFTER the invitation has been sent to guests and will NOT show in draft form while creating the invitation. The option will only show if you make your list public (i.e. not hidden guest list to invitees). You can set the reminder to be sent 24 hours in advance or more. Evite also has an app for smartphones. Includes an interactive list, printable list, ability to list meal preferences and allergies and you can send invitations via email, Facebook, Twitter and more. It will also send reminder emails to participants 24 hours prior to event. It’s a bit more basic also in that they don’t have a ton of images to set a theme but it gets the job done otherwise. Perfect Potluck allows you to specify different categories of what to bring. One thing that is different than the others is that Perfect Potluck also offers recipe ideas of what works well for group meals. So if your guests need a little inspiration, they can do find it all in one place. This service does not have images for themes though. But one cool thing is that they have a Potluck Calculator that helps you estimate how many types of dishes you should ask for. For example, for a party with 30 guests, it suggests 3 people bring appetizers (1 appetizer = 20-30 small servings), 6 people bring side dishes (1 side dish = approximately 5 cups). This is a neat feature! Here are a few other of My Favorite Tips for Potluck Party Success! Determine how many guests you will be hosting and plan accordingly. Set a theme if you’d like to make it a little more fun. Check out my Party Ideas and Party Food Bars Pinterest board for inspiration! The host usually provides the main dish and asks guest to bring sides and desserts. You want to make sure you have enough food but not too much. Consider adding a small dollar amount as an option to contribute to the main meal or beverages or even decorations and serving items. These are great options for guests who are too busy or not interested in cooking. Don’t forget the serving ware. Whether it’s disposable paper and plasticware or a call for borrowing items someone may have on hand, put it on the list! I know I recently attended a party where the hostess needed a few more wine glasses so I brought my set of 8 stemless glasses that I had purchased at Costco. Make space in the kitchen for last minute preparation. Check out my tips for a How to Set up a Great Buffet for ideas on how to organize your food layout. Have extra serving utensils on hand for guests who forget or didn’t think to bring them. Decide if it will be a bring-your-own-beverage event and state that on the invitation. If you’d like guests to bring beverages to share, specify how many you’d like. For example, a 12-pack of beer or 1 liter of red wine. Plan to have nonalcoholic options as well like juice or punch, water, tea, etc. Offer to-go containers for guests to share any leftovers. It’s fun sometimes to bring home a variety of foods from a party you attended and it cuts down on an overabundance of food for the host and possible food waste. Need storage space? If the dish you plan to bring requires refrigeration or heating, check with the host first so they can prepare accordingly. Keep it simple! Most contributions should be ready to go when you arrive and require minimal preparation. Think about transportation. Will you be walking it over? Will you be driving. Make sure you choose a storage container or serving dish that will travel easily with few spills. Keep in mind the total number of guests who will be attending. It doesn’t make sense for everyone three people who sign up for a dessert to bring two dozen cupcakes, for example, when only 20 people total will be attending. Heed the host’s guidelines accordingly. Label your serving dishes and utensils if it will be a large gathering. You can often find budget-friendly options at the dollar store or discount stores like Target or Walmart so that if your items do not make it back to you, it will be ok. If you like to arrive early check with the host first or be prepared to be put to work! Everyone has their own style and some hosts may be working up until the last minute. Unexpected early guests can sometimes add unnecessary stress. I’m glad you found it helpful Sarah! Love these tips! I’ve heard of the sign up websites before, but haven’t yet tried one. As a homeschooling mom, I think they’d be useful for other events as well, even if no potluck is involved. Thanks for the post! Thanks for the feedback Mariana! 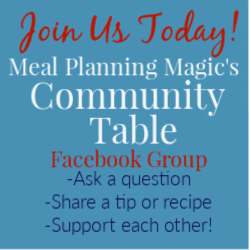 Yes, I use the sign-ups for so many more things than just meal organizing too–they are very handy!